Looking for the 10 Best Sit-On-Top Kayaks, look no further. We have sorted through a pile of kayaks and found the very best values in kayaking out there! When shopping for a kayak, your first decision will be whether to get a sit-in or sit-on-top kayak. 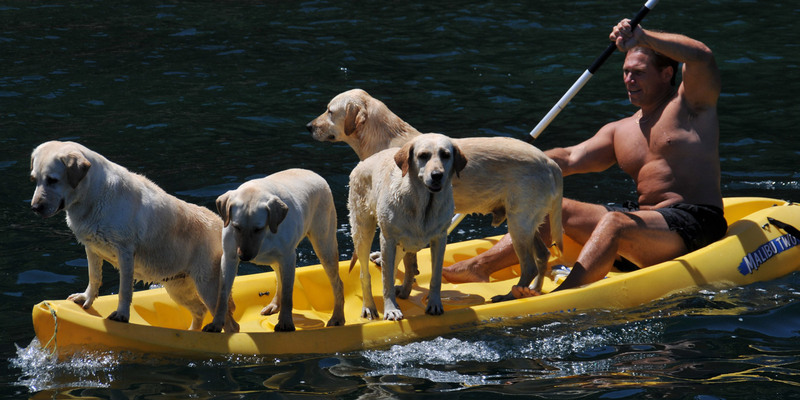 Sit-on-top kayaks (often referred to as SOTs) are the easiest to use and very versatile ways to have fun on the water! A sit-in kayak is great for keeping your legs dry while paddling in cold water. With a sit-in kayak, you sit inside a cockpit in the hull of the boat. However, if you are a bit adventurous, you may be more inclined choose the freedom and simplicity of the sit-on-top kayak, especially if you don’t mind getting a little wet while you paddle. With a sit-on-kayak, you sit inside a molded indentation on the top of the boat with your legs exposed. Sit-on-top kayaks aren’t the best choice if you are planning on spending a lot of time in cooler weather and cooler water conditions, however, because you will not be as protected from the elements as you would in a sit-in kayak. With the freedom of sit-on-top kayaks, you can easily jump into the water for a quick swim, and then climb back onto the sit-on boat with little effort. Sit-on-top kayaks are also one of the most popular versions for kayak fishing. If you are interested in reviews of kayaks for kayak fishing check out our reviews here. Lots of sit on tops are also 2 person or tandem kayaks. We have reviews of tandem kayaks here. When considering the purchase of a sit on top kayak, one way to approach the task is to seek out several sit-on-top kayak reviews from existing customers to get a better idea of what they liked and disliked. Customer reviews can inform potential buyers regarding the consumers’ experiences with design, stability and maneuverability of the boats. Knowing this information can help a buyer narrow down their choices and make the decision a bit easier. Below is a list of 10 of the best sit-on-top kayaks for sale on Amazon as determined by customer reviews. The Ocean Kayak 12 foot long Malibu Two is a favorite model of novices and pros alike. Consistently one of the best sit-on-top kayaks, this boat can accommodate two adults and one child. The versatile boat handles well over rugged ocean surf, rough whitewater and serene lakes. Though designed as a tandem, the kayak works just fine as a solo vessel as well. Customer sit-on-top kayak reviews consistently rave about the stability and durability of the Ocean 12 foot Malibu Two. The kayak is lightweight, coming in at about 60 pounds, so it is easy to maneuver from the car or cabana to the water. Upon delivery, your kit will include the vessel and two comfortable seat backs. Paddles and other accessories must be purchased separately. The Ocean Kayak Frenzy is reviewed by many happy customers as the best sit-on-top kayak currently available on the market. This boat is so easy to use and take anywhere. It is small yet still has a wide weight range with a max capacity from 275-325 lbs. It’s a small and compact kayak that can carry a lot of gear. It is also very easy to paddle. Its small 9 foot length and 43 pounds makes it is easy and worry-free to take when you are ready to hit the water. The kayak comes ready to go, and all you have to do is just add a paddle and life jacket. The deck rigging makes it easy to store your gear and helps prevent it from falling off the boat. Additionally, a smaller cooler fits perfectly in the back molded storage spot and can be held in with the deck bungee cords. This customer reviewed favorite is great for family fun, fishing or just cruising on a calm lake for more recreational kayaking. The Ocean Kayak Frenzy is one of the most fun sit-on-top kayaks we have tested, designed adult and children of all ages. The Ocean Kayak Prowler Big Game Angler Sit-On-Top is the most highly rated fishing kayak on Amazon, and it is no mystery why this is the case. This beautiful boat is 12 feet and 9 inches in length and can accommodate up to 600 pounds. The boat’s wide platform provides unmatched stability. Rod and cup holders are molded into the body of these boats, along with a scupper system where you can mount your fish finder if you are an angler. This kayak has an extra-large stern tank and a side keeper for your paddle. The proprietary support track foot braces keep you stable as you reel in that big score. The Prowler is available in orange camo, brown camo, and urban (gray) camo. This eMotion Temptation sit-on-top kayak model is built for speed. A great touring boat, this kayak is very versatile on all waters and for all purposes. Dual Ledge Lock paddle mounts keep both paddles attached to the boat to keep your hands free when needed. The Emotion Temptation can hold a total of 275 pounds. The kayak remains straight while you paddle, and glides well so you can conserve your paddling strength and not get fatigued as fast. The self-draining hull ensures that the kayak won’t sink which further improves its durability as well as reliability while on all kinds of water conditions. Customers who have purchased the Lifetime 10 foot Tandem Sit-on-Top kayak rave about this boat and claim it makes a great family recreational kayak. Though the kayak can accommodate up to three people, it handles very well as a solo kayak too. Well designed, stable and strong, consumer reviews highly recommend this model especially if it will be used for shorter trips. Seats and foot blades are ergonomic to keep you comfortable while paddling. The Lifetime sit on top can accommodate up to 500 pounds of paddlers and cargo. The boat is so stable that many reviewers report that they stand up in it while fishing. More than one review noted that one of the best features of Lifetime kayaks is that they are made in the USA. Whether you are an angler looking for a reliable fishing kayak, or a family looking for a good sit-on-top kayak for recreational use, then the Lifetime 10 foot Tandem Sit-on-Top kayak may be the best choice for you. The one-person Perception Tribe 9.5 is actually 9 feet, 6 inches in length, and can support up to a 300 pound load. Choose from stunningly vibrant colors, including Lime and Yellow, Red and Yellow and Sea Spray – a blend of white and various shades of blue. The padded seat is adjustable and the anchored handles make the boat easy to carry and transport. Scupper holes will quickly drain any water you take on which helps improve the safety and security of this boat. The Perception Tribe is also designed as stackable for improved storage. Many people new to kayaking will purchase an inflatable kayaks to gauge their interest and affinity for navigating the open waters. This Coleman model is a favorite model of those seeking an inexpensive way to gauge their interest and affinity for the sport with an affordable sit-on-top kayak option. If you are in search of affordable inflatable sit-on-top kayaks, then the Coleman Quikpak K1 is an excellent choice. Customers who previously purchased this boat report that the vessel handles and tracks well in most conditions, and is very easy to maneuver and paddle. You can also keep your favorite beverage close with the embedded cup holders feature. Secure storage enables you to keep your valuables hidden and dry. Setup takes about five minutes, so it is ready to go easily and quickly. For those short on storage, deflate and roll the Quikpak to store in a closet. The boat stores in a backpack that converts into the seat. This SEAFLO kayak makes traveling to your paddling destination as easy as it gets! This sit-on-top kayak is made from two thermoplastic sections that you can quickly and easily connect and disconnect, and this allows you to store and transport a kayak where you might not usually have the room to. Each section is only about 23 pounds and about 52 inches. Put it together and you have a stable 8 foot and 2 inch kayak for your flat-water adventures! The weight capacity is 320 lbs and has room for storage, both a dry compartment and on top storage option. If you love traveling around to find the next beautiful lake or river to paddle but don’t have much storage room–you’ve just found your kayak! By far, the most highly rated hardshell sit on top youth kayak on Amazon is the Wave, and it is available in either yellow and green. This lightweight kayak is easy for smaller boaters and anglers to handle because it weighs in at just a mere 18 pounds. The vessel is built with reverse chine for enhanced stability and control. Parents love the fact that the boat will not tip over which makes it a safer option for your beginner kayaker! Children up to 5 feet tall can comfortably sit-on-top of this model. Even the little ones can control this kayak because it is so easy to paddle and maneuver. Purchase includes both the kayak and paddle. If you prefer to traverse the calmer rivers and lakes solo, consider the one-person Sun Dolphin Bali SS model. The Bali SS is available in five vibrant colors, including red, green, ocean blue, pink and orange. This kayak ships with a portable accessory carrier, adjustable foot braces and soft thigh pads to protect your legs while paddling. The Bali SS is eight feet in length and can accommodate a 197 pound load. The boat weighs 40 pounds so it is light and easy to carry. Choosing the best sit-on-top kayak does not have to turn into a chore when you are given some viable and affordable options and know exactly what to look for. To determine which of these models is best for you, consider the type of kayaking you will be doing, the weather and water conditions you will be exposed to, how much gear you will have to stow away with you, and how many people you will include on your trip. Once you determine this information, you can further narrow down your choices and you may find that one of these 10 best sit-on-top kayaks is for you!